Ah, screw it. It's on sale! The new Nexus 7 is on sale at select retailers today despite the fact that Google's own store won't ship the tablet until early next week. Best Buy, GameStop, and Walmart are confirmed to be selling the 7-inch slate, with customers walking into stores and able to pick up the device right now. "They're going really fast," a Best Buy employee told TechRadar an hour into the store's opening this morning. "The new Nexus 7 tablet and the little Chromecast are going to sell out quickly." Amazon is also selling the Nexus 7 2, but that of course doesn't include in-store pick-up. The leading online retailer is offering Saturday delivery, however. While Google is waiting until June 30 to start shipping its stock of new Nexi, it has opened the floodgates on pre-orders. This morning, the Google Plays store began allowing customers to add the 16GB and 32GB versions of the tablet to their carts and checkout. Whichever capacity these tablet buyers go with, they'll have an Android 4.3 Jelly Bean device with 2.3 million pixels, and may be lucky to have snagged an order. 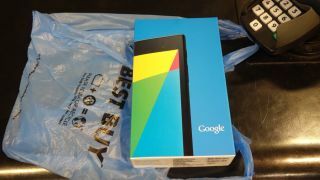 In the past, both the original Nexus 7 tablet and Nexus 4 smartphone sold out for an extended period of time on the Google Plays store and were backordered for several weeks. Chromecast is selling fast too, though that free Netflix subscription is no more.